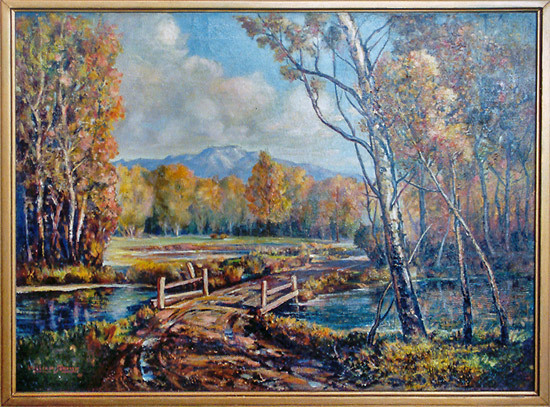 SHOWING A COUNTRY LANE AND BRIDGE OVER A STREAM. SIGNED, "46. WILLIAM - .JOSEPH BROWN, 1865 - 1949. LIVED IN HUNTINGTON PARK, CALIFORNIA. CALIFORNIA BEFORE 1930. FRAMED SIZE 31 X 26, UNFRAMED SIZE 28 X 20.